Photograph courtesy SLS NSW - The new Life Members were honoured guests at the 2017 NSW Surf Life Saving Championships at Blacksmiths Beach. 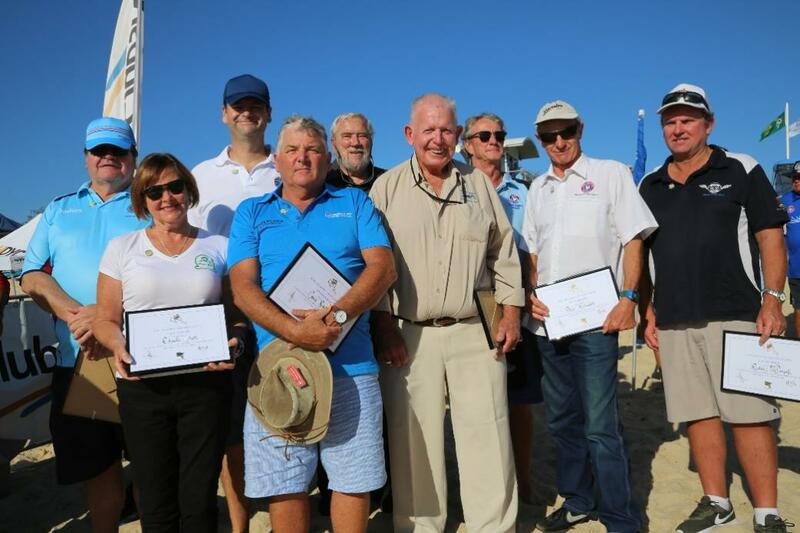 It was a day to remember at the recent NSW Surf Life Saving Championships at Blacksmiths Beach for a group of distinguished lifesavers who were presented to the wider movement as the latest inductees of the exclusive club of State Life Members. This group of nine members have dedicated a combined 400 years to Surf Life Saving and have been involved at Club, Branch, State, National and even on the International stage. They have been presidents, competitors, trainers, assessors, officials and of course patrolling surf lifesavers. From the time they joined the Surf Life Saving Movement they became part of the rich tapestry which stretches back to the first decade of the twentieth century while also carving their own path. Surf Life Saving NSW extends its congratulations to the following members on their elevation to Life Membership. Garry joined Dee Why SLSC in 1968 and gained his Bronze Medallion that year. He spent two years at the Northern Beaches club before he moved to the Central Coast and joined Copacabana SLSC in 1972 where he held multiple positions including club President. During his time at Copacabana he was President for a total of three years and Senior Vice/Vice President for a further three. He also trained over 150 surf lifesavers while he was the Club Instructor/Trainer. Garry was instrumental in promoting surf sports at the club, introducing surf skis and re-designing the club’s competition cap in the mid-1970s. For over 40 years, he was the R&R and March Past Coach and was an Official at all carnival levels. Garry was the first Copacabana member to achieve medals at Branch, State and National championships, the first to hold Branch and State positions and to obtain his IRB Drivers award. He was the Deputy President of CCJSLSA (Central Coast Junior Association) for three seasons in the 1980s and was the NSWJSLSA (NSW Junior Association) Superintendent from 1985 to 1990. Garry gained Club Life Membership in 1984 and was awarded Central Coast Branch Life Membership in 2013. Terry has been a surf lifesaver for an incredible 51 years. He joined North Curl Curl SLSC in 1965 and gained his Bronze Medallion the following year. In 1984, he moved to the Lower North Coast where he became a member of Black Head SLSC. To this day, Terry is a member of both clubs and has held various positions including President and Vice President of Black Head. At Branch Level, Terry has been the Director of Surf Sports for the last 11 years. Terry has been an Instructor/Trainer at Black Head SLSC since 1968 and has been an Official since 1999. Terry has officiated at local, Branch and NSW Championships where he has been the Board Riding Referee at both Country and State Championships for over six years. Terry has been a competitor for many years, mainly as a surf boat sweep and board rider. A wall and floor tiler by trade, Terry has also given a vast amount of his time to his club and other local surf clubs upgrading and repairing clubhouse facilities. Terry was awarded Black Head Life Membership in 2006 and a year later was presented with Lower North Coast Life Membership. John joined Bondi SBLSC in 1968 and obtained his Bronze Medallion in 1970. Since then, John has been a member of three other Sydney clubs; North Bondi, Burning Palms and Wanda. Today, John is an active member of both Bondi and Wanda SLSCs. Throughout his time as a surf lifesaver, John has held various positions including President of Sydney Branch and Sydney Branch Juniors for five and six years respectively. As President of Sydney Branch, John contributed to the SLSNSW State Council. John has held positions at all four clubs, mainly at Bondi where he was President, Treasurer, Secretary, Team Selector and Team Manager for more than 25 years. In recent years, John has played a key role at Wanda and has continued his involvement with Sydney Branch. At Wanda he has been the Director of Administration, Member Services and Lifesaving. He is the current Director of Finance for Sydney Branch and selected the team which won the Interbranch Championships in 2016. John achieved Life Membership of Bondi in 1978 and Sydney Branch in 1998. Peter has been a member of Maroubra SLSC for 52 years and Cape Hawke SLSC since 2012. Peter has played a major role in SLSNSW and SLSA development programs and coaching positions since 1998. He devised the Level 1 and 2 coaching courses for SLSNSW and delivered Level 3 instruction with SLSA. Peter was the SLSA Coaching Advisor for 11 years and was part of the High Performance Committee when the Australian team won the 2000 and 2002 World Championships. Throughout his time as a coach, Peter has influenced and mentored many surf sport competitors which was highlighted when he established the North Coast Academy of Sport. Peter has also spent a lot of time in other countries implementing and conducting coaching clinics. Peter also negotiated and prepared a submission to the Australian Sports Commission to have Level 1 and 2 Coaching Courses recognised. In 2016, he was awarded with his 30 year Surf Life Saving Coaching Service Certificate. To this day, Peter continues to win medals as a competitor at both NSW and Australian Championships. Despite Peter’s dedication to sport, he proved to be an invaluable member of Maroubra’s patrolling team. He served as Club Captain and was awarded a 10 year medal for patrol service. North Bondi’s Peter Agnew has been heavily involved in all aspects of Surf Life Saving for over three decades. After obtaining his Bronze Medallion in 1985, Peter proved to be an effective and dedicated surf lifesaver and made significant contributions at a club, state, and national level. Some of his many achievements at North Bondi include serving as Club Captain, IRB Captain, Assistant Chief Instructor and Club Vice President. Since 1986 he has served with distinction at Branch level and is currently Deputy President. He holds a Level 3 accreditation as a Surf Sports Official, and has had a particular interest in education having been a member of the highly active committee for seven seasons. Professionally Peter worked at Surf Life Saving Australia for a decade first as National Lifesaving Manager and later as General Operations Manager. During this time he continued his work on various volunteer committees as well as being heavily involved with his club. In recent summers he has been a member of the SLSNSW Grievance Committee, and outside of Surf Life Saving was honoured with an Emergency Services Medal in 2015. Peter was recognised with Life Membership at his beloved North Bondi club in 2005 and was also elevated to Life Member status at Sydney Branch the following season. Like many Australians Rhonda Lycett’s introduction to Surf Life Saving was through her children when she became a Nipper parent in 1979 at Mona Vale SLSC. The following year she took on the role of Age Manager, a position she would hold for another seven seasons and also served as Treasurer for the junior club. Searching for her next challenge she started officiating in 1985 and has been a welcome and familiar face on the beach ever since. Rhonda obtained her Bronze Medallion in 1995 and her influence on the senior club has been just as profound where she has held positions including Registrar, Chief Instructor and Training Officer. She’s also dabbled in the coaching area and coached R&R and Championship Lifesaver competitors to NSW medals. At a Branch Level she has served as Team Manager, Team Chaperone, Official, and was awarded Recorder of the Year. Even now she can often be found on the beach on a Sunday morning, encouraging and mentoring the next generation of Nippers and is always willing to share a laugh, tell a story and reflect on her own experiences. In 2016 Rhonda’s dedication to the Sydney Northern Beaches Surf Life Saving community was formally recognised when she was elevated to Life Membership. Rod McDonagh’s distinguished career in Surf Life Saving began when he joined Cape Hawke SLSC in 1979. After obtaining his Bronze Medallion in 1981 he served continuously in many positions at his club including Club Captain and Competition Captain. He also competed in all disciplines during this time including the IRB in what was to later become a special interest to him. During this period he became involved with the Branch and served as a member of the Finance Committee and Chaired the Competition Committee among others. Work took him further north but he wasn’t lost to Surf Life Saving, becoming a member of South West Rocks SLSC. He enthusiastically embraced his new club and was elected President in 1997 and still holds this office 20 years on. Rod continued working at a Branch Level and was elected Branch President in 2011. His dedication to all Mid North Coast clubs and his willingness to engage with all stakeholders has made him a valued member of the community. In the last two years he has continued to drive the very successful NSW Country Championships in his role as Chair of the Organising Committee. Between 1990 and 2016, Rod officiated at 12 World Life Saving Championships including roles as a Starter and Deputy Referee. He was acknowledged for his efforts with the International Lifesaving Federation Platinum Medal presented to him at Rescue 2016 in The Netherlands. Rod is a Life Member of the club and Branch and has made a sustained and lasting impact on Surf Life Saving on the Mid North Coast. Alistair “Slim” Peebles began his journey in Surf Life Saving in the 1974-75 season when he joined Avoca Beach SLSC. After obtaining his Bronze Medallion, Slim spent the next 18 summers as an active patrolling member and also contributed heavily behind the scenes for his club. At various stages he has been Club Captain, Branch Superintendent, Competition Manager and a Member of the Board of Examiners. He was deservedly elevated to Life Membership at both Club (1998) and Branch Level (2007). An early adopter of the IRB Drivers qualification, Slim certainly found his niche both as a competitor and later coach and manager of touring teams both in Australia and internationally. The Boxing Day Tsunami of 2004 left an impact on him and alongside fellow Avoca Beach Life Member John Mitchell, Slim was a driving force behind an initiative to deliver a program on safety and beach culture to Thai locals living in Phuket and Phi Phi Island. This program has continued to evolve and expand in recent years with Slim making several trips overseas to continue both training and delivering equipment, while Thai Lifeguards have also come to Australia to enhance their own skills and experiences. Over the last four years Slim has also been a familiar presence at the State Championships driving the courtesy bus at Ocean Beach-Umina. Despite not being a member of either of the host clubs, his willingness to get in and help out is what has endeared him to the broader lifesaving community. Craig Susans joined Queenscliff SLSC in the 1970-71 season and obtained his Bronze Medallion in 1973. A passionate champion surf sports competitor in his own right, Craig’s desire to give back to the movement that had given him so much enjoyment was the catalyst for a relationship and legacy that continues to grow. At a club level he served as Deputy President and later did a two-year stint as President and remains an active committee member among the many positions he has held. Drawing on his history as a competitor and confident he could communicate well with athletes, Craig undertook his Official Accreditation course in 2001. It is a trait that has earned him the respect of all those he has worked with and he continues to play an important role at all carnivals that he is involved with ensuring that competitors, officials, and spectators come away with positive memories. Over the years he has worn many branch hats including serving as SNB Director of Surf Sports, Branch Team Selector and Officials Mentor but it is perhaps as referee that he has really made his mark. Since 2007 he has refereed at numerous club, branch, state, and national carnivals. At Blacksmiths Beach in 2017 he will again be in the official hot seat as he performs his role of carnival referee for the Masters Championships. Craig received Life Membership at Queenscliff in 2003 and for Sydney Northern Beaches in 2016.